Construction works may begin in 2008 and take six-seven years, with costs put at EUR 400 M.
Patriarch of the Romanian Orthodox Church (BOR) Daniel yesterday performed a religious service to bless the cornerstone and consecrate the land on which the Nation’s Cathedral will be built. “The Cathedral will be dedicated to the Ascension of Jesus Christ, which is celebrated in summertime and which is in fact the day when all national heroes are honoured, and to Saint Andrew, the Patron Saint of Romanians, who is celebrated early in the winter,” the Patriarch explained. 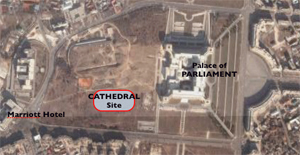 The Cathedral will be built behind the Parliament Palace, on Calea 13 Septembrie. According to the Patriarchy spokesman Constantin Stoica, half of the amount (EUR 400 M, editor’s note) will be allotted for actual construction works, which will take about three years, with the remaining money to be spent on finishing works, painting, decorations, lighting and heating systems, which may take another three years, the Patriarchy spokesman said. The Cathedral will be able to host 5,000 people, with the project also including an esplanade to accommodate a large number of believers. Construction of the Nation’s Cathedral has sparked countless disputes over the years between governmental officials and the Bucharest City Hall. Since 1996, BOR has been offered several offers from the Bucharest authorities for the location of the Cathedral, but only on March 3, 2005 did Patriarch Teoctist informed the Holy Synod about the resolution of the National Church Council under which the Calea 13 Septembrie tract of land offered by the Bucharest City Hall was accepted. 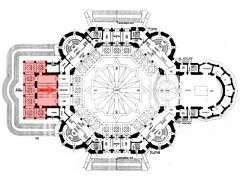 “This place has been analysed by experts, architects and engineers, who found it suitable for the Cathedral building,” late Patriarch Teoctist stated at the time. Attending the event, Premier Calin Popescu Tariceanu said that the RON 30 M allotted by the Government for the construction of the Cathedral “must stimulate further donations from other individuals or institutions, for the funding of this important construction.” The decision to allot RON 30 M (approx. EUR 10 M) was taken this October, when the Government of Romania and the Romanian Patriarchy signed a protocol of cooperation in the field of social inclusion. On the very day when the foundation stone for the Nation’s Cathedral was laid, a Holy Synod decision – not many details on which have been made public – sparked disagreement among church officials. The decision refers to changes in the regulations for the organisation and functioning of BOR, to the effect that lay members of the Church Electoral Board (CEB) are deprived of decision-making power in the election of senior church officials. It is the same lay members whose vote contributed to the inauguration of the incumbent Patriarch. Yesterday’s issue of ‘Gardianul’ daily reads that works of the Holy Synod have been rather tense these days, with articles 127-131 in the current regulation draft growing into a bone of contention. The said articles regulate the election of the upper church leaders (from Bishop to Patriarch), in which the part played by one of the most important church bodies, the CEB (which includes a significant number of lay members) is virtually done away with. The decision was fiercely criticised by Metropolitan Bishop of Cluj Bartolomeu Anania. Some 120 Orthodox churches have been built each year in Romania since 2001 – or about one church every three days – according to a NGO report. A total of 2,000 Orthodox churches have been built in the 15 years since communism ended, while 1,000 were still under construction, the report from the non-governmental organization Solidarity for Liberty of Conscience said on Friday. The Orthodox Church, to which almost 90 percent of Romanians belong, saw a surge in popularity after communism ended in 1989. Companies and public figures, including sports stars and politicians, have donated money for church construction. “One church every three days is not much, compared with the area of the country and (the fact) that there are 18 million Orthodox believers,” Culture Ministry adviser Ionut Corduneanu told the daily Cotidianul. In Bucharest – called “the city of 300 churches” in the mid-19th century when the population was about 400,000 – there are now just 280 Orthodox churches for the city’s two million residents. “There is a shortage of Orthodox churches, mainly in urban areas,” Corduneanu said. During four decades of communism, the state encouraged atheism and frowned upon church attendance. It was considered a damaging career move to openly attend church. About 18 churches were demolished in Bucharest in the last five years before Communist leader Nicolae Ceausescu was overthrown and executed in 1989, as the city cleared space for apartment buildings as part of a grand urbanization plan. The Orthodox Church is strongest in rural areas, and is seen as being involved in the daily activities of the peasants who make up about half of the country’s population of 22 million. In these areas, the church celebrates nature and life, with a large number of holidays, feast days, periods of fasting as well as traditional Christmas and Easter. 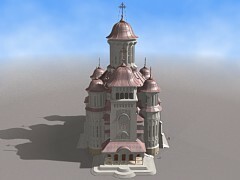 The Orthodox Church decided to build a cathedral to mark 2,000 years of Christianity on Romanian territory. The construction will begin next year. While the project, recently approved in Parliament, has generated enthusiasm and publicity, some have complained that the investment should go toward constructing more, smaller churches across the capital. 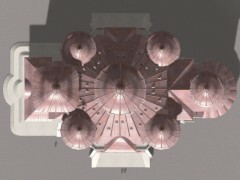 The National Redemption Cathedral is expected to cost around 200 million euros. Part of the money was raised by the church and it is part supported by the government. However, in order to cover the entire cost of the building, the Orthodox Church is considering entering the financial market through a bonds issue, according to Cotidianul. In order to get approval for the operation, the Church’s finances must be audited, in order to see if the institution will be able to pay interests to the buyers. The bonds will be later sold through a public offer and listed on the stock market, according to Stere Farmache, head of the Bucharest stock exchange. Unlike Bucharest, Orthodox churches have sprung up in smaller cities, such as the Black Sea port of Constanta, the Danube port of Galati, and the Transylvanian cities of Brasov and Baia Mare.